When I started refereeing in 1980, at the tender age of 22, I wrote to Clive, for advice. I sent the letter addressed to “Mr Clive Norling, Referee, Birchgrove, Swansea. Sadly I have lost the letter, but the one bit of advice I still remember is “the referee is the least important person on the field, the game is for the players” that I think summed up Clive’s philosophy, although you could never accuse him of being anonymous on the pitch, whether it be the tight shorts, the perm, or the huge and somewhat portly frame, sandwiched into that red shirt, with the three feathers bursting to escape from the left pectoral region. Clive’s letter didn’t cover advice on this kind of situation. 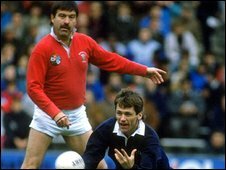 From his first international in 1978, between Ireland and New Zealand, to his last in 1991, he had a real empathy for the game, and funnily enough most of the games he refereed were entertaining to watch, although the light aircraft flour bombing the New Zealand v South Africa match, at which he was officiating was a somewhat added extra. All I know is that he inspired me to take up the whistle for 10 years with Dorset/Wilts and briefly the London Society, I even grew a moustache to make me look more like him. After he hung up his whistle Clive inspired at an even greater level. He publicised his battle with depression in an effort to help others combat the illness, and to raise awareness of this still somewhat taboo subject. We are very lucky in Wales when it comes to our top referees, and Clive’s spirit lives on with the wonderful Nigel Owens, long may it continue.